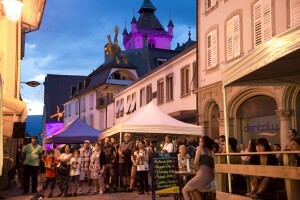 I spent the last three nights in Estavayer-le-Lac to attend the 10th edition of the Swing-in the-Wind Jazz festival. Estavayer is in the same region where I live (State of Fribourg) so I know where to go and where to find a parking spot. Estavayer is little medieval town and it has the perfect scenery to spend a summer night outside and listen to Jazz music. I have attended this festival last year, so it was on my focus again and the line-up convinced me to buy a festival pass for all three nights for the main stage (most of the concerts are free, but there are some headliners for whom you have to pay). The first night started with Thierry Lang and his band with Darry Hall on bass and Mario Gonzi on drums plus Olivier Ker Ourio on harmonica. Their choice of tunes was a set of standards played very elegantly and confidently. Thierry Lang has huge fan base in the area and you don’t see him live very often. He was well prepared and it was great fun. At the end of their show they invited Diane Tell for two chansons (Diane Tell played the second show on that evening) and it was a nice surprise and a perfect encore for this concert. 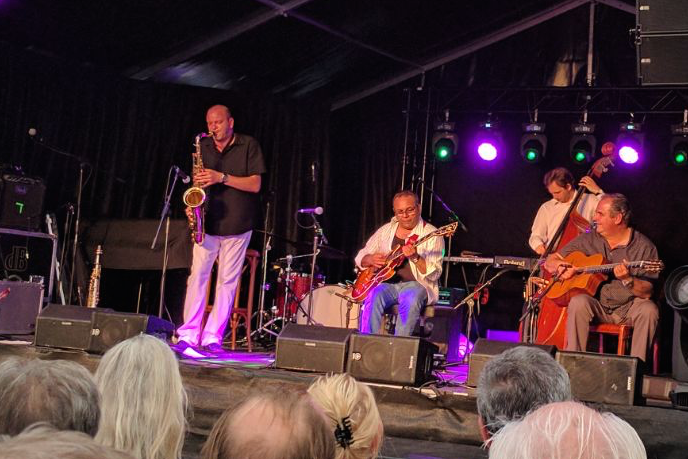 The headliner for the second night was Bireli Lagrene and his Acoustic Quartet with Franck Wolf on saxophone, Hono Winterstein on rhythm guitar and William Brunard on bass. Bireli and his musicians showed their excellence and especially Bireli Lagrene is a guitar player who has no limits and who invents new techniques and sounds on his instruments. It was absolutely incredible what he is able to do. I saw him earlier this year at the Jazz festival in Bern, so I knew what to expect, but again I found some of his playing freshly and surprisingly. The third night had two unknowns for me: Champian Fulton with her trio and Rhoda Scott with her Lady Quartet. Champian Fulton came all the way from New York for this single concert to Switzerland and she was in a high spirits, she enjoyed playing very much and she and her band with Giorgos Antoniou ­on bass and Steve Brown on drums produced the perfect swing sound, sometimes very “vintage” but perfectly played. Champian is a great singer with a real bluesy voice and her piano playing has it’s best moments when she plays chord melodies. She presented some of the tunes of her latest album, which she did for posi-tone records (I follow this label for some years now and try to get each year all new releases). The songs on this latest CD called “Speechless” are instrumental-only, so if you search for an album where she sings, be careful. In total, a great show from her, impressive also the band enjoying to play real fast up-tempo tunes. The last concert of the festival was the Rhoda Scott Lady Quartet with Rhoda Scott on the Hammond organ, Sophie Alour on tenor sax, Julie Saury on drums and a young excellent clarinet player whose name I unfortunately forgot. Again a band that sometimes sounded and played very “vintage”, like the great combos did play in the 50′s or 60′s. Those bands with a Hammond organ play all very bluesy, old-fashioned funky and the Rhoda Scott Lady Quartet was no exception here. There approach is traditional but their playing wasn’t, especially Sophie Alour plays a contemporary style. Also striking was Julie Saury on drums, very driving and pushy. The band played some tunes of her latest CD “We Free Queens” which one could buy after the concert. I got one copy and it has very nice and well played material on it. Finally a great thank you to the committee that organized this festival so perfectly. There were some thunderstorms during the concerts but they caused no interruption to the concerts, unfortunately it was not always possible to sit outside and enjoy a balmy summer evening. I will keep this festival on my list and watch out again next year what happens. If the line-up is interesting I will come again. I like the atmosphere in this little medieval town very much and I also like the whole concept of this festival with free and paid concerts, so aficionados come and pay for the headliners and those who want to sit outside, eat and drink and want to get entertained enjoy the free concerts all over Estavayer-le-Lac.